There is nothing more relaxing for me than to get into my kitchen, turn on my music and cook, I love cooking, it is my favorite hobby, most of the time I like to cook traditional Mexican recipes, but sometimes I like to experiment and create new recipes with a Mexican touch, well, you know, I love Mexican cuisine, I think it is one of the best. Anyway, today was one of those days when I had time for myself and when that happen, I tent to spend that time either in the kitchen or having a coffee reading a cookery book, so today I cooked lunch for one and I came out with this delicious soup. It is a very easy recipe and it will take you no more than 20 min to have it on the table ready to eat. 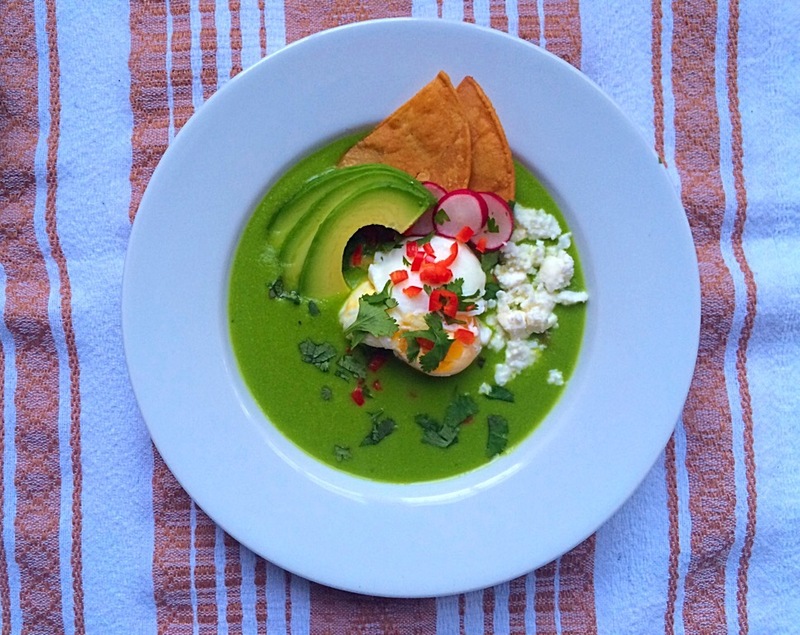 It is a pea soup but with a Mexican touch, so I added chargrilled green pepper, if I have had poblano pepper, I would have used that, but I didn’t have so a green pepper is fine, then I added fresh jalapeños, onion and coriander and I topped it with a poached egg, avocado slices, homemade tostadas, fresh cheese and I scattered some fresh chilli, coriander and radishes to add more flavour and a bit of a crunch. So here is the recipe, I hope you like it as much as I do. First chargrille the peppers on the hob, like in the picture, once chargrilled, place them in a plastic bag, after 10 min, peel the black skin off, deseeded, chop and leave aside. Then fried the tortillas on some vegetable oil. I cut them in triangles and I fry them for 2 min on each side on low medium heat. Then set aside. Make the poached eggs, one at a time. Add a small dash of vinegar to a pan of steadily simmering water. Crack eggs individually into a ramekin or cup. Create a gentle whirlpool in the water to help the egg white wrap around the yolk. Slowly tip the egg into the water, white first. Leave to cook for three minutes. Drain onto kitchen paper. Chop all the vegetables to garnish the soup and leave aside. Make the soup. In a sauce pan, fried the onion until transparent, then add the frozen peas, 2 cups of stock or water, chargrilled green pepper, coriander, jalapeños salt and a pinch of pepper and cook for 10 min. Then blend until smooth and continue cookinf for 5 min. Serve in a shallow bowl, place the soup first, then the egg, vegetables and the last but bot least the tostadas, so they remain crunchy.